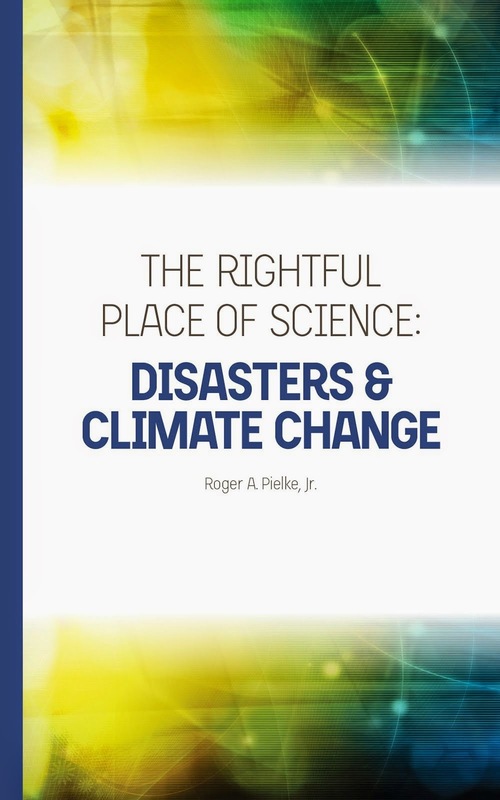 Last week in a Congressional hearing, John Holdren, the president's science advisor, characterized me as being outside the "scientific mainstream" with respect to my views on extreme events and climate change. Specifically, Holdren was responding directly to views that I provided in Senate testimony that I gave last July (and here in PDF). To accuse an academic of holding views that lie outside the scientific mainstream is the sort of delegitimizing talk that is of course common on blogs in the climate wars. But it is rare for political appointee in any capacity -- the president's science advisor no less -- to accuse an individual academic of holding views are are not simply wrong, but in fact scientifically illegitimate. Very strong stuff. Given the seriousness of Holdren's charges and the possibility of negative professional repercussions, via email I asked him to substantiate or correct his characterization, to which he replied quite quickly that he would do so in the form of a promised follow-up to the Senate subcommittee. I hope this note finds you well. I am writing in response to your characterization of me before the Senate Environment and Public Works Committee's Subcommittee on Oversight yesterday, in which you said that my views lie "outside the scientific mainstream." This is a very serious charge to make in Congressional testimony about a colleague's work, even more so when it comes from the science advisor to the president. Your characterization of my views as lying "outside the scientific mainstream" is odd because the views that I expressed in my testimony are entirely consonant with those of the IPCC (2012, 2013) and those of the US government's USGCRP. Indeed, much of my testimony involved reviewing the recent findings of IPCC SREX and AR5 WG1. My scientific views are also supported by dozens of peer reviewed papers which I have authored and which have been cited thousands of times, including by all three working groups of the IPCC. My views are thus nothing if not at the center of the "scientific mainstream." I am writing to request from you the professional courtesy of clarifying your statement. If you do indeed believe that my views are "outside the scientific mainstream" could you substantiate that claim with evidence related specifically to my testimony which you characterized pejoratively? Alternatively, if you misspoke, I'd request that you set the record straight to the committee. Today he has shared with me a 6-page single space response which he provided to the Senate subcommittee titled "Critique of Pielke Jr. Statements on Drought." Here I take a look at Holdren's response. In a nutshell, Holdren's response is sloppy and reflects extremely poorly on him. Far from showing that I am outside the scientific mainstream, Holdren's follow-up casts doubt on whether he has even read my Senate testimony. Holdren's justification for seeking to use his position as a political appointee to delegitimize me personally reflects poorly on his position and office, and his response simply reinforces that view. 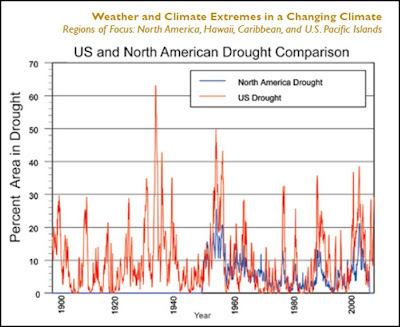 His response, (which you can see here in full in PDF) focuses entirely on drought -- whereas my testimony focused on hurricanes, floods, tornadoes and drought. But before he gets to drought, Holdren gets off to a bad start in his response when he shifts the focus away from my testimony and to some article in a website called "The Daily Caller" (which is apparently some minor conservative or Tea Party website, and the article appears to be this one). Let me be quite clear -- I did not write anything for "The Daily Caller" nor did I speak or otherwise communicate to anyone there. The quote that Holdren attributes to me - “directly contradicted scientific reports” -- is actually written by "The Daily Caller." Why that blog has any relevance to my standing in the "scientific mainstream" eludes me, but whatever. This sort of sloppiness is inexcusable. Leaving the silly misdirection aside -- common on blogs but unbecoming of the science advisor to the most powerful man on the planet -- let's next take a look at Holdren's substantive complaints about my recent Senate testimony. Let's now look at Holdren's critique which he claims places me "outside the scientific mainstream." Holdren Complaint #1: "I will show, first, that the indicated quote [RP: This one: "“droughts have, for the most part, become shorter, less frequent, and cover a smaller portion of the U. S. over the last century.”21"] from the US Climate Change Science Program (CCSP) about U.S. droughts is missing a crucial adjacent sentence in the CCSP report, which supports my position about drought in the American West. . . That being so, any reference to the CCSP 2008 report in this context should include not just the sentence highlighted in Dr. Pielke’s testimony but also the sentence that follows immediately in the relevant passage from that document and which relates specifically to the American West." "The main exception is the Southwest and parts of the interior of the West, where increased temperature has led to rising drought trends." Um, hello? Is this really coming from the president's science advisor? Holdren's reply next includes a section on drought and climate change which offers no critique of my testimony, and which needs no response from me. Holdren Complaint #2: Holdren implies that I neglected to note the IPCC's reference to the fact that drought is a regional phenomena: "Any careful reading of the 2013 IPCC report and other recent scientific literature about on the subject reveals that droughts have been worsening in some regions in recent decades while lessening in other regions." Holdren Complaint #3: Near as I can tell Holdren is upset that I cited a paper from Nature that he does not like, writing, "Dr. Pielke’s citation of a 2012 paper from Nature by Sheffield et al., entitled “Little change in global drought over the past 60 years”, is likewise misleading." The bottom line here is that this is an extremely poor showing by the president's science advisor. It is fine for experts to openly disagree. But when a political appointee uses his position not just to disagree on science or policy but to seek to delegitimize a colleague, he has gone too far. What Does it Mean to be Anti-Growth?